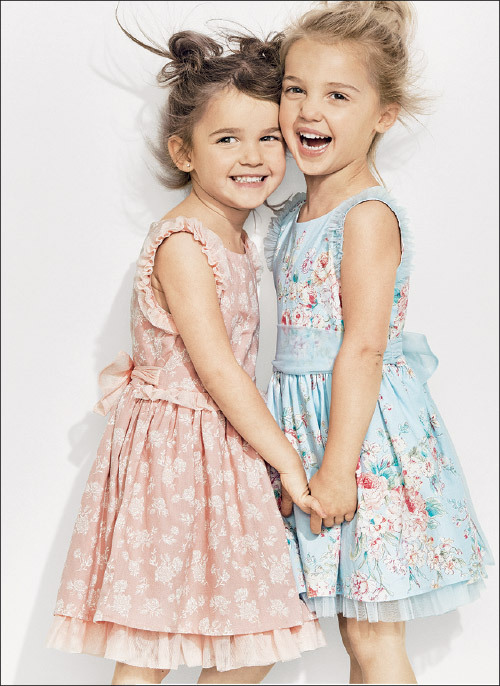 Four-year-old twins and social media sweethearts Mila and Emma Stauffer add fashion designer to their resumes—before pre-k! You probably recognize sassy sisters Mila and Emma Stauffer from their viral videos that gained more than 11 million hits on Instagram. Captivating viewers with their adorable toddler voices, the girls are known for satirizing grown-up gripes, like sticking to a diet, going through airport security and sitting next to chatty strangers. The twins, who turned four this past Halloween, have not only raised the following on their mother’s Instagram (@KCStauffer) to more than 4 million but also garnered a Facebook following of more than 5.2 million along with several celebrity fans like Shawn Mendes, 50 Cent, Reese Witherspoon and Kris Jenner. Most recently, Mila and Emma were spotted in New York, sitting front row at Fashion Week around the time the girls were promoting their new eponymous Mila & Emma clothing line, released last month in Target stores and at Target.com. This is just the beginning of the Mila & Emma clothing enterprise. In early May, expect a line of Mila & Emma swimwear to hit shelves and more categories to follow in future seasons. In the meantime, the girls are busy making more videos for their YouTube channel, Mila & Emma. Aimed at young kids, the channel features videos of the girls doing fun activities like ice cream challenges, sharing their (very honest) opinions of toys, music, games and fashion, and even the occasional interview of movie stars, like Channing Tatum, James Corden and Danny DeVito at the premiere of Small Foot. So what’s it like to be four and famous? “We go to a lot of parties,” Emma says. “And we get tons of stuff in the mail—I like it,” Mila adds. How was your first day of pre-k? Emma: It was so fun! Mila: We did karate and read stories, but we had to be quiet. What do you like to wear on the weekend? Emma: Dresses, but sometimes mommy makes us wear pants. Mila: Yes—bows and jewelry! We like pink. Mila: Tall boots for everything. Emma: Play with our toys, watch movies or have parties. Does your mom buy more clothes for you in store or online? Mila: In stores…I think. Right, Mommy? What’s one fact people would be surprised to know about each of you? Mila: I used to be super scared of dogs. Emma: I don’t like loud noises. Mila: An actress and a doctor. Emma: A doctor and an actress. Mila: I have some questions! What’s your favorite animal? Movies: Anything with princesses or zombies.